We recommend checking out our discussion threads on the Maxpedition Jumbo L.E.O. 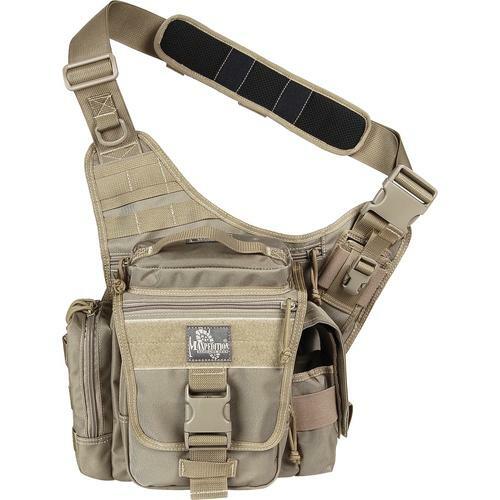 Versipack Concealed Carry MAHG-9846B, which address similar problems with connecting and setting up Shoulder Bags Maxpedition. The user manual for the Maxpedition Jumbo L.E.O. Versipack Concealed Carry MAHG-9846B provides necessary instructions for the proper use of the product Photography - Bags & Cases - Shoulder Bags. The black Jumbo L.E.O. Versipack Concealed Carry Bag from Maxpedition is a large, durable and ergonomic shoulder sling pack that provides the secured containment, and rapid accessibility, of daily equipment. Maxpedition took the feedback from hundreds of law enforcement customers into consideration in designing and creating this L.E.O. variant of the Jumbo Versipack. Multiple external pouches hold individual pieces of your gear, while loop fields and nylon webbing accommodate Maxpedition's modular hook & loop expansion accessories. A specially designed mag pouch fits two M4/M16 30md magazines, or a radio, with elastic tension and a hook & loop flap enclosure. In addition to this large ammo pouch, the front pocket houses elastic webbing to carry up to four handgun magazines. Each Versipack comes with a 2.0" wide non-slip shoulder pad providing great comfort during extended use. The L.E.O. 's rear/CCW slip compartment is equipped with loop fields to accommodate more hook & loop modular accessories. This allows you to position your concealed carry firearm for a quick strong side draw or a weak side cross draw - should such a situation arise. If you own a Maxpedition shoulder bags and have a user manual in electronic form, you can upload it to this website using the link on the right side of the screen. Side A: 6.0 x 3.5 x 2.0"
Top of lid: 6.5 x 3.0 x 1.0"
Box Dimensions (LxWxH) 11.0 x 11.0 x 3.0"
The user manual for the Maxpedition Jumbo L.E.O. Versipack Concealed Carry MAHG-9846B can be downloaded in .pdf format if it did not come with your new shoulder bags, although the seller is required to supply one. It is also quite common that customers throw out the user manual with the box, or put the CD away somewhere and then can’t find it. That’s why we and other Maxpedition users keep a unique electronic library for Maxpedition shoulder bagss, where you can use our link to download the user manual for the Maxpedition Jumbo L.E.O. Versipack Concealed Carry MAHG-9846B. The user manual lists all of the functions of the Maxpedition Jumbo L.E.O. 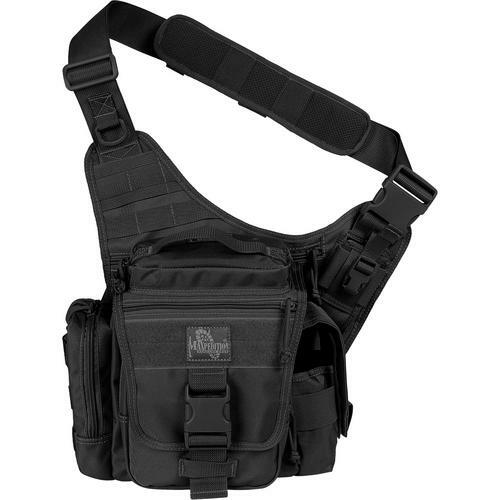 Versipack Concealed Carry MAHG-9846B, all the basic and advanced features and tells you how to use the shoulder bags. The manual also provides troubleshooting for common problems. Even greater detail is provided by the service manual, which is not typically shipped with the product, but which can often be downloaded from Maxpedition service. If you want to help expand our database, you can upload a link to this website to download a user manual or service manual, ideally in .pdf format. These pages are created by you – users of the Maxpedition Jumbo L.E.O. Versipack Concealed Carry MAHG-9846B. User manuals are also available on the Maxpedition website under Photography - Bags & Cases - Shoulder Bags.